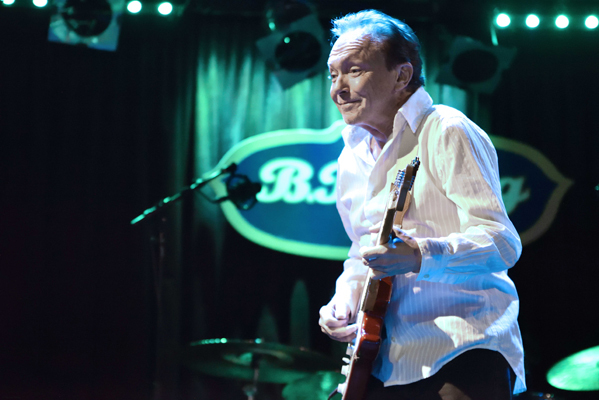 With David Cassidy, 66, retiring from touring this year due to the onset of hereditary dementia, I was glad to catch his last NYC appearance. Cassidy told a few stories to provide context to his 47 year career, and I’ll give some too here, as he’s had an interesting journey. Cassidy explained from the stage that he chose BB King’s for his last NYC performance because he really likes the club and the late B.B. King himself, and due to it being in Times Square, which is where he made his acting debut in a Broadway musical. It was called The Fig Leaves Are Falling and it was in 1969 when Cassidy was 19. Although it closed after only four performances, a casting director saw it and asked Cassidy to do a screen test, whereby he moved from West Orange, New Jersey to Los Angeles and signed with Universal Studios soon after arriving. He then appeared in a few T.V. shows, but of course his big break came the following year when he landed the role as Keith Partridge in the show The Partridge Family. The program, which ran through March of 1974, was about a musical family with the lead being matriarch Shirley Jones, Cassidy’s actual step mother in real life. While Cassidy was signed primarily for his teen idol looks in addition to being able to act, he convinced the show’s musical producer Wes Farrell that he was good enough as a singer to be the family’s lead vocalist, rather than Jones, who was and is an actual singer. They then soon had a big hit with “I Think I Love You,” composed by Tony Romeo. This opened the door to Cassidy having a hugely commercially successful and prolific musical career. Ten albums by The Partridge Family and five solo albums were produced during the show’s run, with most selling more than a million copies each. Cassidy had become an international sensation as a solo star, selling out major arenas around the world. These concerts produced mass hysteria, resulting in what was referred to by the press as “Cassidymania”. It was all short lived, however, as most of it was hinged on Cassidy being a teen idol figure, although he was in in his early twenties. It was difficult to sustain real success in the ensuing decades as Cassidy and the teen aged girls that were his primary audience aged and the times changed. Musically Cassidy became more of a heritage act than anything else. Another obstacle was that Cassidy didn’t compose very many of his songs in an era when most other artists were. Cassidy was in good form tonight and seemed happy, although he sweated a good deal. His eyes are highly sensitive to bright light and he explained that he’s had several eye surgeries and is soon having another. Cassidy didn’t say what the surgeries are specifically for, but he pleaded with the audience to turn off flashes and video lights. He also asked them to not talk while he’s talking, and to instead wait until he’s done. Unfortunately, a few audience members went ahead and used the flash anyway, either intentionally or unknowingly. Cassidy became very aggravated and frustrated with this, which I can understand. He told one to get out and seriously chided a couple of more. He told a few stories about his growing up, one of which clearly meant a lot to him. It was of how he attended a concert of B.B. King as a late teenager and then asked King if he could carry his guitar case with King’s beloved guitar named Lucille inside it to the blues star’s car after the show. King obliged, and they spoke for a couple of minutes, just the two of them, as King was alone. Cassidy noted to King that he was an aspiring actor and that he was really hoping to make it. King wished him well and said that he seemed like a nice, decent young man. Cut to a few years later, Cassidy said that he and King were both at an industry event, by which time Cassidy had indeed become successful. Cassidy reintroduced himself to King, and reminded him of their previous brief encounter. King said he remembered it and gushed how happy he was for Cassidy. Another story was how he was born here in NYC, but as a youngster moved to West Orange, New Jersey to live with his maternal grandparents since his parents, Jack Cassidy and Evelyn Ward, were both actors and traveling a lot. Cassidy spoke about the sudden change of of life when he uprooted to Los Angeles in 1969 to pursue his own acting career. He said that the song Hush by Deep Purple was blasting out of car’s speakers upon arriving in L.A., and therefore that song has meaning to him. He then performed it. Cassidy’s band was very good. Bassist Frank Fabio wears many hats, serving as musical director, tour and production manager. Guitarist Dave Robicheau was very tasteful, and spent fourteen years with the late Davey Jones, lead singer with The Monkees. Jones and Cassidy were good friends and shared the unique experience of being in a T.V. show musical group that became a real life one, or in Cassidy’s case a real solo musical star. Robicheau was playing a very cool looking, silver sparkle Dunlop guitar. Keyboardist Craig Snider is a multi instrumentalist, composer and record label owner, so he’s an integral member. Drummer Felipe Torres was very solid, doing a short drum solo with his bare hands. Cassidy played some guitar on a red Fender Stratocaster most of the time, and also played a song on the drums while a young female singer whose name I missed guested on vocals for Brass In Pocket by The Pretenders. All in all I truly enjoyed the concert, in part because it was good to be there for Cassidy’s final concert in his home town as he said goodbye to touring. All the best to you, David.